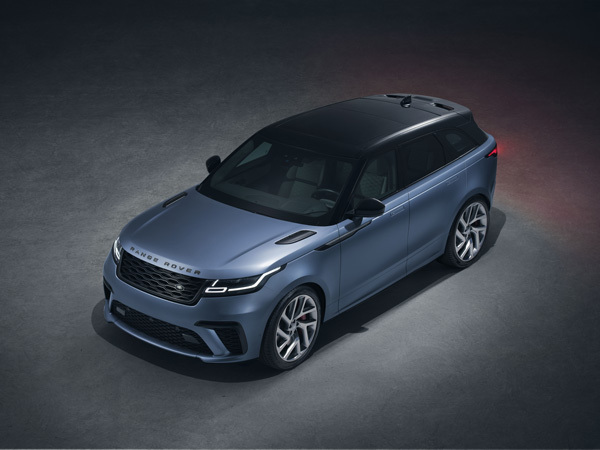 Land Rover has launched a limited edition, performance version of the Range Rover Velar. Welcome to the SVAutobiography Dynamic Edition. Topping the luxury, mid-sized SUV line-up, this exclusive Range Rover is only the second in the family to wear the badge after the introduction of the Range Rover SVAutobiography Dynamic in 2017. 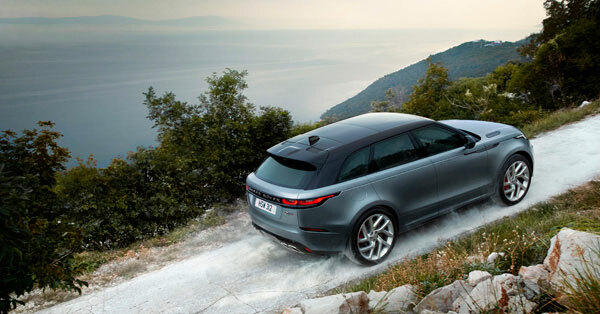 Up front is a supercharged 5.0-litre V8 petrol engine producing 550PS and 680Nm of torque, which propels the Range Rover Velar from 0-62mph in a mere 4.5 seconds and onto a top speed of 170mph. 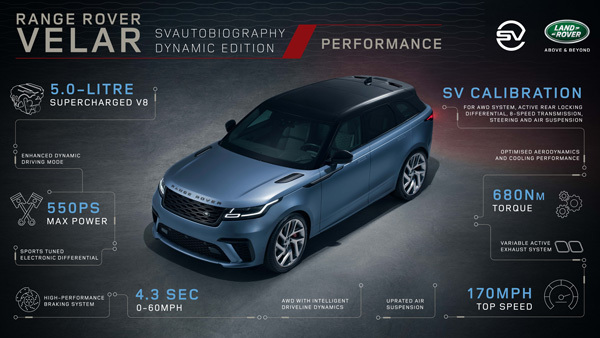 In addition, Special Vehicle Operations (SVO) has fitted the new Velar with uprated brakes, anti-roll bars and suspension, while giving the SVAutobiography Dynamic Edition a more purposeful appearance thanks to a new grille, redesigned bumpers, a quad-exhaust system and larger front air intakes. A set of distinctive forged aluminium 21-inch alloys, which weigh in at the same as 20-inch rims on the core model, and the standard contrast Narvik Black roof complete the look. SVO’s engineering team has also spent more than 63,900 hours fining tuning and optimising the car’s ride, handling and responsiveness. As a result they have created bespoke calibrations for the SVAutobiography Dynamic Edition’s all-wheel drive (AWD) system, active rear locking differential, eight-speed automatic transmission, steering and air suspension. A revised Continuously Variable Damper set up, with the addition of firmer springs, allows the air suspension to deliver a balance of composure and comfort on the road. The AWD has been uprated too with the transfer box capable of withstanding the higher loads generated by the supercharged V8 engine, while the Intelligent Driveline Dynamics is able to direct 100 percent of the power to the rear wheels in certain conditions. The electric power steering system has been tweaked to minimise the effort required to manoeuvre the car at low speeds, while delivering precise and direct control at higher speeds, with the Velar’s Dynamic mode being enhanced to suit drivers with a more enthusiastic driving style. Inside the Range Rover Velar SVAutobiography Dynamic Edition, owners will find an upholstered cabin finished in twin-stitched, perforated and quilted Windsor leather available in four colours – ebony, cirrus, vintage tan and pimento. There are also 20-way electrical adjustable seats fitted with heating, cooling and massaging functions for the front passengers to enjoy. 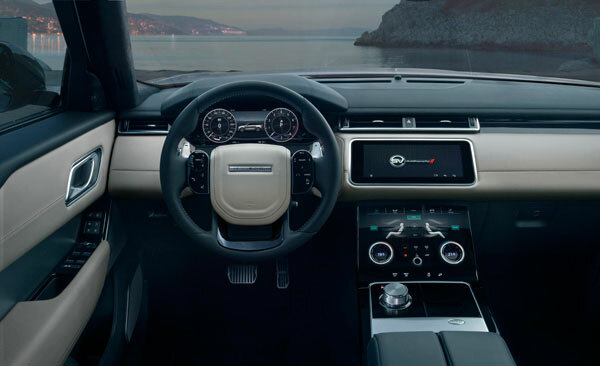 There is also a unique sports steering wheel and contoured aluminium gear shift paddles, while the rotary dial gear selector and Touch Pro Duo infotainment system have been given a knurled finish. These fine details carry over to the digital displays, with the 12.3in interactive Driver Display featuring ‘digitally knurled’ dials to complete the sophisticated interior look. The new Range Rover Velar SVAutobiography Dynamic Edition is only on sale for one year and is priced at £86,120 OTR in the UK. View the Range Rover SVAutobiography Dynamic Edition gallery here.